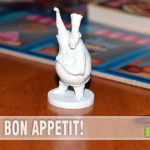 First off I have to apologize to everyone, especially Asmodee, for taking so long to post photos and commentary about one of their latest games, Colt Express. We picked up a copy at Gen Con this year and have been meaning to tell you all about it for nearly two months. Why the delay you ask? Every once in a while we come across a game that is more fun to play than talk about (and we LOVE to talk). This is one of those games. 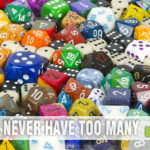 I’ve also mentioned how we love finding extra value in games that let you participate in the construction of the individual components before playing. 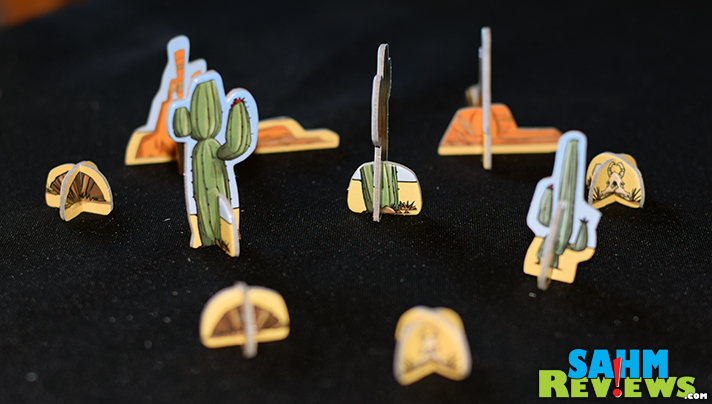 I’m not talking about applying stickers or simply punching out chits from a sheet of cardboard, but actually putting together elements that play an important role in the mechanics of the game. 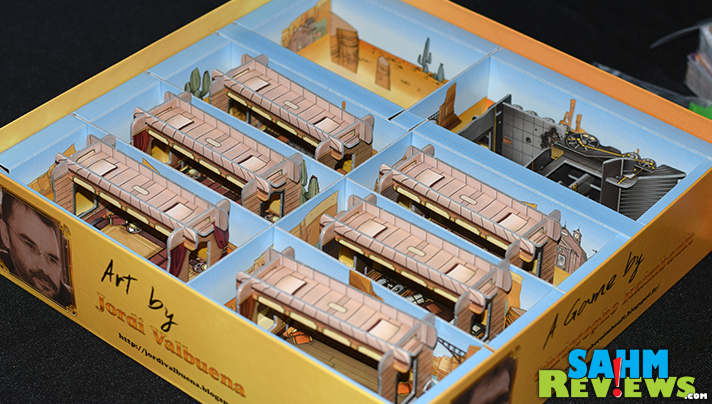 In Colt Express you get to build the entire game board! 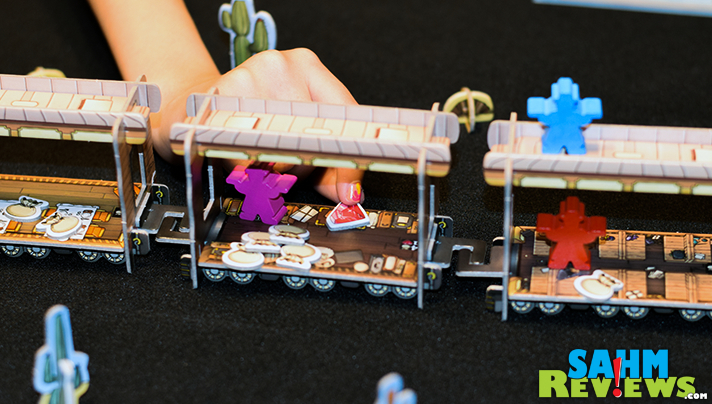 Well, not so much a board but a 3-dimensional train that your avatars move up, down and across for the entire game! And the end results are nearly as satisfying as putting together that old Revell plastic model I used to love as a child. If you think all of these pieces are destined to be lost after a couple plays, you’re wrong. 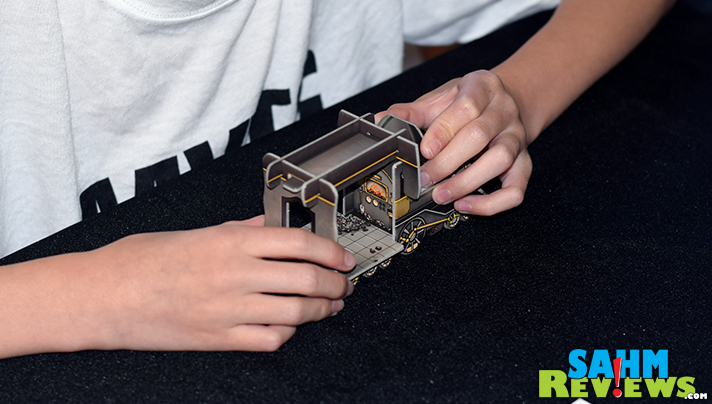 Part of the assembly includes a custom storage solution that fits perfectly into the game box. Once complete, everything stores away nicely, ready for the next session. But the assembly process is just a bonus, as without a good game behind it, it is nothing more than an expensive puzzle. 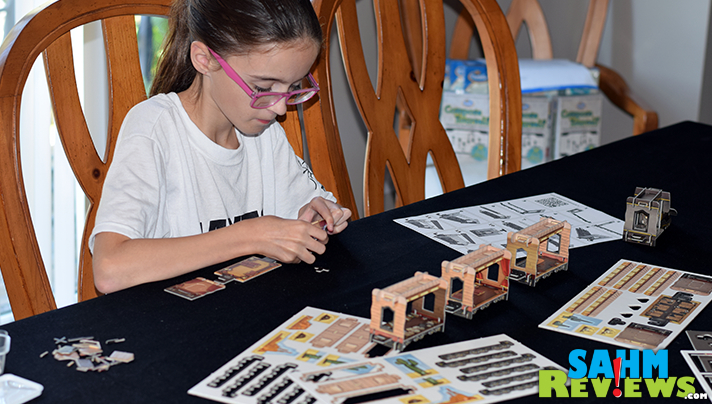 Fortunately Colt Express is as good (if not better) than any family game we’ve ever played. And nothing like anything else in our collection – so that’s the reason for the delay. I’m not kidding when I say it has already been played over a dozen times at multiple places since our return from Gen Con. Friends’ houses, our house, Xenocon game convention as well as at our Friday game nights at a local college! My girls can’t seem to get enough of it! 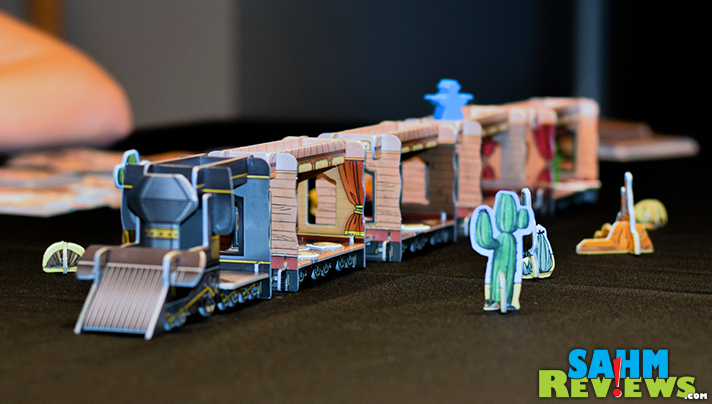 So what is Colt Express? 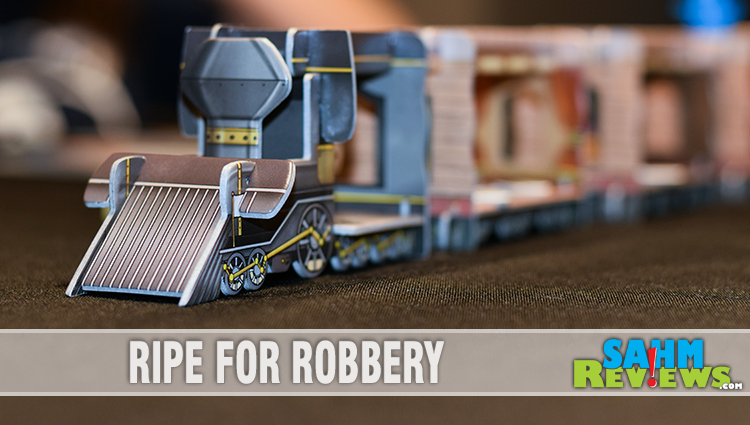 It’s a game of train robbery that pits you against other robbers (your opponents) all trying to gather the most treasure while avoiding each other and a Marshall that is there to guard the train. Each player plays as a different character with unique abilities, but everyone has the same actions they can perform. 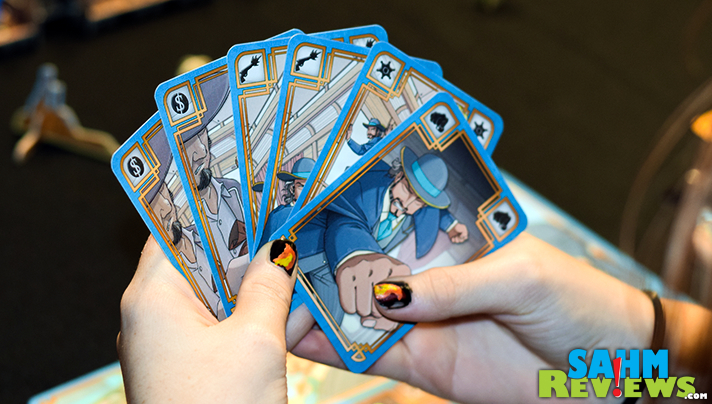 Choosing from a hand of six cards, you can have your robber move, shoot, punch or pick up money, or move the Marshall through the train to have him attack your opponents. In a typical round you will choose 3 or 4 actions, but the successful completion of these choices also depends on what your opponents select. Going around the table you put your action choice in a pile. Sometimes the order will be reversed, other times you will place the card face-down. You may or may not know what your opponent is doing, and their actions will certainly affect you in some manner. They may pick up the bag before you have a chance to. They may punch you, forcing you to drop a loot and knocking you into the next car. Or even worse, you might be shot and have to put a worthless bullet card into your hand, leaving you with fewer action choices for the rest of the game! Ultimately you want to collect as much treasure as you can, and perfect timing of your actions will be necessary. Avoiding the Marshall is also something you must be wary of. Taking a shortcut across the roofs of the cars might help you make a quicker escape, especially since the more valuable pieces are closer to the front of the train. 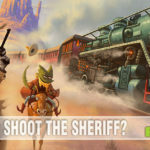 Colt Express is played over a number of predetermined rounds according to the number of players. Expect a full game to last around 45 minutes and can accommodate up to six players or as few as two. The interaction of your actions makes this game very social as you rue over why someone else’s choice ruined your chance of grabbing some treasure or made you drop some of your ill-gotten gains. Once all turns have been taken, the player who managed to keep the most loot wins. Each piece is turned over to reveal their differing values, with many having a much higher value than you anticipated. It is truly not over until all the money is counted to see who was the most successful thief! I can almost guarantee you do not have a game like this in your collection, and you really should. 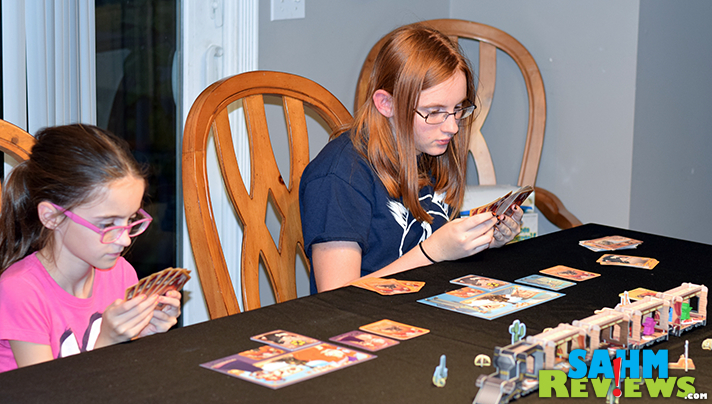 Colt Express runs around $30 on Amazon and will most definitely hit the table many times over just like it did for us. I don’t often exclaim a game as a must-have, but if you are in the market for a family-oriented title that has both strategy and social aspects, then this is the one. 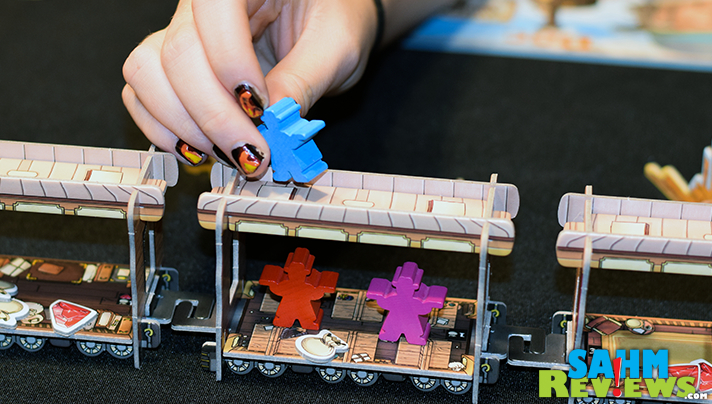 Even without the bonus of self-assembly, you’ll find a ton of value in Colt Express. 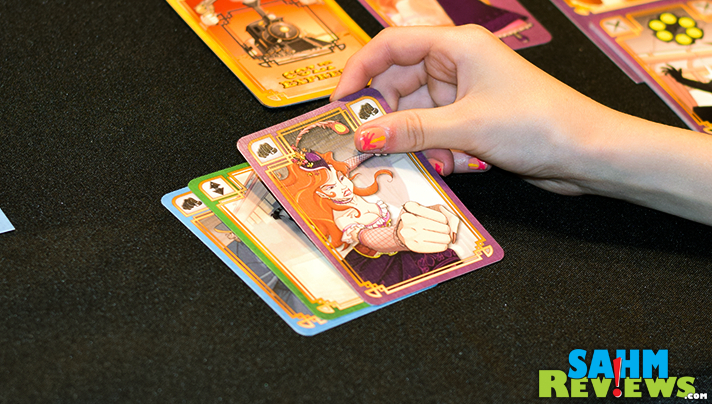 Does the name Asmodee sound familiar to you? It should, they’re one of the largest hobby game publishers in the world and the name behind many super-popular titles like Takenoko, Splendor and many many more. Take a peek at their Facebook and Twitter timelines for great new product announcements and maybe a deal or two! A Game Not About Zombies or Vikings! One of my top 3 games to try as soon as possible. 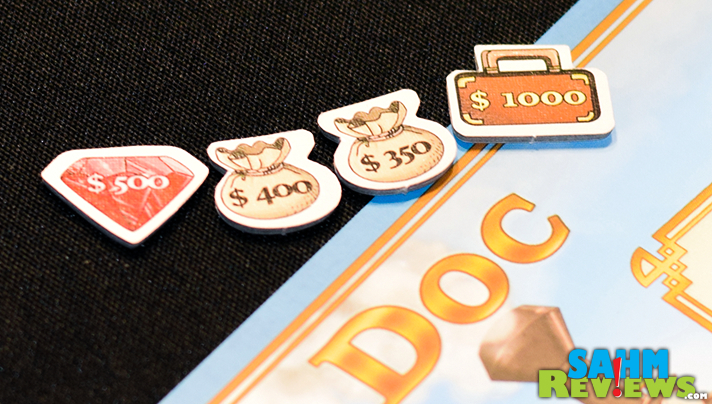 Wow, the components of this game look fantastic! Throw in the wild west and it sounds like a lot of fun. Thanks for sharing! The components are great, Brad. We have quite a few games that end up damaged because there isn’t a good storage option for them once they are assembled. Asmodee took care to design the box to protect the pieces! This looks like a pretty fun game! The components look fun. My kids are still too young for the planned actions but with adults it could be fun to watch things go all wrong. Oh, Stephen, playing with adults is quite comical as you often unintentionally (or sometimes intentionally) mess up their plans! This look so fun! I think we would love this to play with the grandchildren! Thanks! 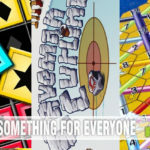 Other then the fact that I am all thumbs when trying to put anything together–if I could get someone else to do that I know I would love this game! this seems like a fun game. I like that it is a bit of a puzzle to put together so it is like two games in one fun for kids and adults. First off, I love your game reviews. I seriously love them. Next, this looks amazing! I was a little hesitant to like this game with all those little pieces that can get lost, but I love that there is a custom storage spot for everything. This looks great! That sounds like a fun game. I love the construction idea. And it would be fun to mess up each other’s plans. I love the construction aspect of this game. There aren’t enough women in STEM fields and girls need to build things too. How neat that you get to put the train together too. This sounds like a fun game. My nephews would absolutely love this game! They love trains, and I think they would get a kick being able to put together and build the train. It’s a great Christmas gift idea! I love games with a bit of 3D to them, like Takenoko and Camel Up! Ive been eye’ing up this game for a while now – just need to pull the trigger. Takenoko & Camel Up (Camel Cup?) are a ton of fun too. We’ll be featuring Takenoko and the Chibis expansion very soon! I would put Colt Express right in the same difficulty category, with some similarities to Camel Up with how the camels move. Plus you get to shoot each other! This looks fun! I bet your family loves to have all these games to play! You should score them and list your top 5 favorite!